We encourage you to join us on Tuesday, April 16th from 11:00am – 12:00pm in the Academic West Event Lounge on the 1st floor for a Pizza and Policy Plus. Cyclone Idai has been a major catastrophe making international news circuits in the past weeks. Idai has killed over 500 people in its immediate aftermath, Mozambique’s second largest built city of Beira is 90% destroyed, cholera has broken out, and over 700,000 hectares of food crops in the country have been lost. The cyclone has created a giant inland sea affecting central Mozambique, Zimbabwe, and Malawi. Climate change has contributed to this disaster’s enormous impacts. Yet, what systemic socio-economic factors have exacerbated Idai and its effects in Southern Africa, and in particular, Mozambique? Join Professor Alicia Hayashi Lazzarini of the Department of Geography (Bucknell University) and Skype guest Ruth Castel-Branco, scholar activist and PhD Candidate in the Department of Sociology at the University of the Witswatersrand (Johannesburg, South Africa) to learn more about the underlying issues contributing to this ‘natural’ disaster. 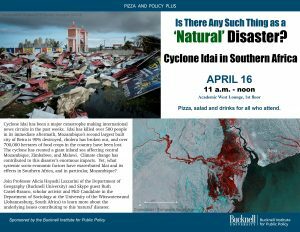 Comments Off on Pizza and Policy Plus: Is There Any Such Thing as a ‘Natural’ Disaster?